Data is not transferred to the back end system to generate the document and push back to the client. Include SAPUI5 controls directly into the output, like charts, tables etc . Step 1: Create a SAPUI5 application project in Eclipse , create a view and develop your UI5 application ( These steps have been discussed multiple times , so i am not discussing it here again ). Now my application looks like the below. I included some header data , a table with stock information, and followed by a graphical representation of profit percentage . When the controls are rendered , corresponding HTML code will be generated . So , if we want to include any SAPUI5 standard controls, we should get the rendered html content. Below is the print format which we are now going to design . Now we will think of some HTML stuffs . All the header information can be rendered using plain HTML tags ( using <div> , <p> etc ) and the table can be created in our choice using the <table> html tag . Graph html code can be taken from the rendered HTML DOM and insert into our print document. In the controller , i am defining a function which accept the JSON data for the header and the table ( for the header and the table ) . In the above code snippet, i am creating the HTML code corresponding to the output expected . HTML DOM for the chart is read using the outerHTML variable from the document . Using the generated HTML string, a popup is opened and the same is printed . Lazy to write the HTML tags for the print out ? This is for lazy people 🙂 Are you not confident enough to write the HTML for your print out ? SCN is there to help you . Step 1 : Create a blog or document in SCN. Here you will get the HTML code . You may need to clean the code based on your requirement . There are many free internet services available to create HTML from MS Word contents . Why go through all the manual hassle of writing HTML output by hand? Could you expand on this a little? I see above where, inside of one function some HTML is written to a window, the window is printed and then closed. Very straight forward. How do I accomplish this, still within a function, by generating the report un UI5? But i see some bottlenecks in that(correct me Robin van het Hof ). What if i need to display a table in the print out with two column merged and having a total column in the bottom like the below, or even deliciously complicated? I don’t think we can achieve all these features in SAPUI5 form , as we can only play with the rendered HTML. Can be perfectly achieved in SAPUI5. Have you taken a look at FlexBoxes (VBox, HBox)? But then again, why would you want to print something that is not already on your screen? 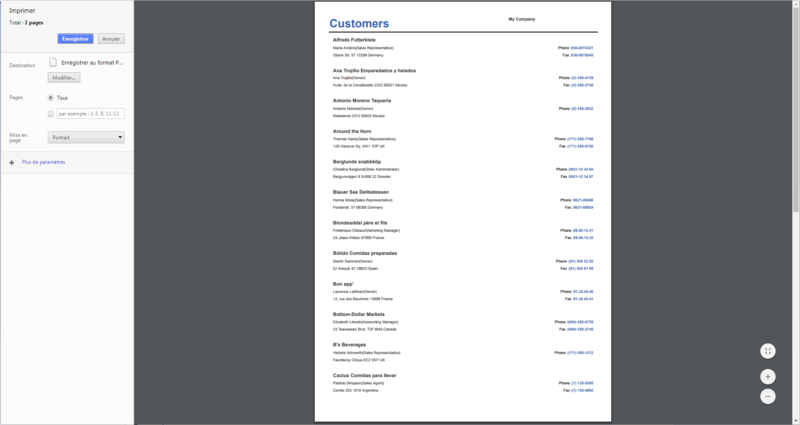 If your purpose is to print a report or something, I would not advise to do it in UI5 but rather use a backend server (Gateway, Java, etc) to generate these forms. that’s right . 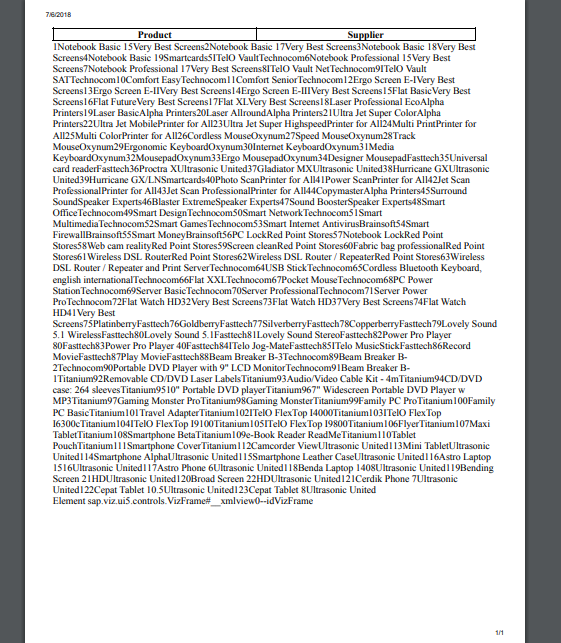 Its not a good idea to print documents based on content available in the browser. Can you please provide more details on how this can be done and how CSS @media print can be used to style ? Very useful one. Great Blog. just see the generated html. Is the check box visibility is correct ? But I’ve got one problem using this method. All the UI5 buttons on the page become unclickable after user clicked the print button. Do you have any idea? print preview properly. am not able to get the chart also, i am using viz frame chart. I am using viz frame chart in my app. how do i print that . It is exactly looking like your app scenario. I have table and chart. table is working perfectly. But chart part i dont know how to print? Could you explain how print planning calendar SAPUI5 please? I’m trying to print it but the position of interval time is not normal. Many of the controls released are not compatible to be printed using this way . May be , using some additional CSS over the code could help you. Thanks for your reply :p.
Actually, I use .print() (or Ctrl+P) . Additionnally, I set visible (false) for the components which are not important in order to print just Planning calendar. I do have similar requirement. Were u able to fix this issue? I am also facing the same issue. I have the similar requirements from the customer, but we are using Ui5 and Hana as a back-end system, so do you have any idea how can we achieve the same functionality in UI5 ? 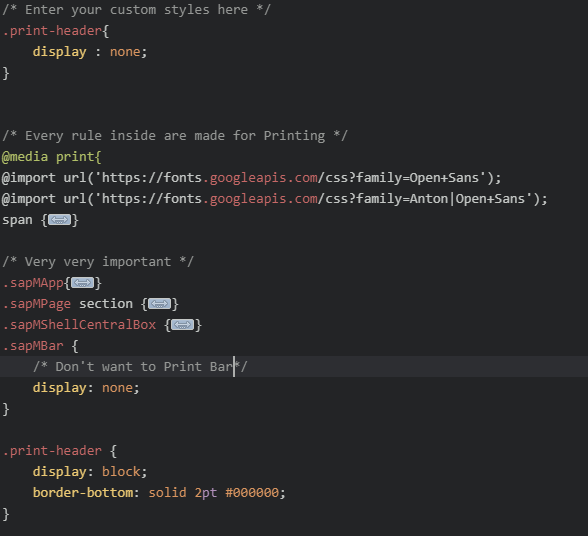 This print functionality is completely executed in the front end and works irrespective of the back end.